Like many estates in North America, Vineland Estates has a wide approach toward the public and offers several services to the visitor : Large tasting room, wine boutique for wines and accessories, restaurant (open year round), private events, daily tours, large parking lot. The winery and most of the vineyards are located on Niagara's most sought-after terroir : The bench part of the Niagara escarpment, which provides cooler temperatures, breeze coming from lake Ontario and good drainage. Vineland's vineyards here have the highest elevation compared with other estates around. Total surface of the estate : 75 acres of which 45 in vineyards, the rest in woods. Average production : 45-55 000 cases. Brian Schmidt, vice president and winemaker, manages the estate with his brother Allan. Born in Kelowna, B.C., he worked at Sumac Ridge, which his family co-founded. 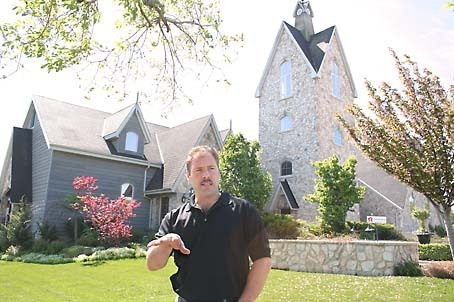 The two brothers moved after Sumac Ridge's sale to the Niagara region in 1987. Brian greets us at the winery (thanks to my friend Ken who made the contact with Brian for this visit !) and tells us how the Niagara region made the leap from more ordinary wines to quality wines 20 years ago : In 1984-1986, the dozen wineries operating then in the region began to plant better grape varieties. 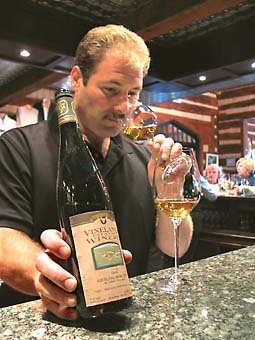 Then in 1988 the VQA system was put in place, with the goal to measure quality improvements and raise confidence among consumers and importers. 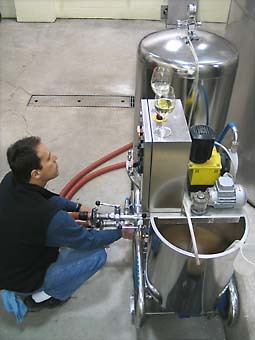 Tasting panels were created to check the wines and since 2001, the VQA is a law : If a producer breaks the requirements of the law, he is subject to penalties. 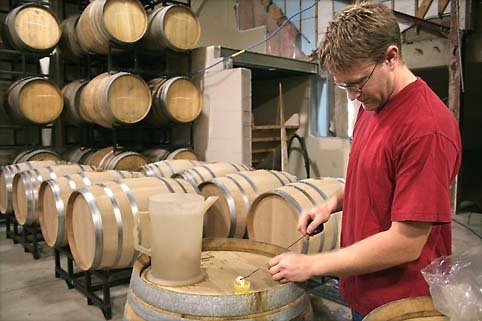 The government also pushes the wineries to join the VQA system as it levies smaller taxes on those who are part of it. Mechage for the new casks : Burning sulphur is attached to a wood stem and will be lowered a few seconds into each of the new casks behind. Before visiting the chai and cellar, he shows us the tasting room and boutique, set in a renovated barn (lots of wood and beams). He says the renovations and added buildings of the recent years were made with oenotourism in mind, and to be able to sell not only through the LCBO system but directly to the public: 6 to 15 people (peak in summer) work in the tasting room/boutique to receive the 120-150 000 vistors/year. __1 Dry Riesling 2005. To cool down after the heat of the outside. Nice texture. Minerality. Then we walk down to the chai and vathouse. 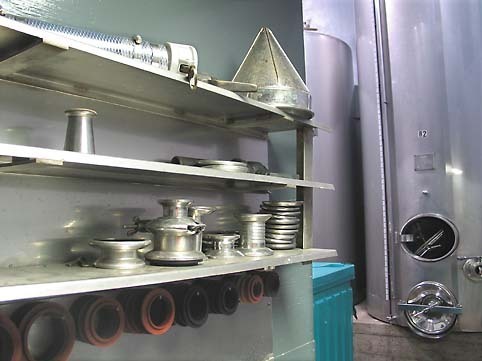 We walk through several rooms with different types of stainless steel vats. The estate has a total vat storage capacity of 300 000 liter. The first room holds a dozen very tall and narrow vats used primarily to settle the whites. The temperature in this room is very cold, much colder than in the following vat rooms. On one of the vats, a hand-written sign reads : Riesling ice wine 02 [picture on left]. We enter a second vathouse, built in 1999 when the production went from 10-15 000 cases/year to about 50 000 cases. 23 big vats in this room, whites only also. 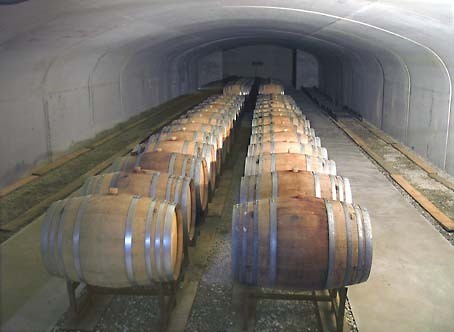 The wine stays there 4 to 10 months depending of the variety. Control panel for the temperature with a 0,5° precision. Other vathouse, now, for the 2nd stage of red wine fermentation. The malolactic fermentation is completed here, after inoculation. In the future , he plans to have more malolactic fermentation done in the casks. On the wall a microbullage control panel. They use micro-oxygenation for Cabernet Franc, it takes away the greeny, stemmy taste and makes it rounder. The technique was introduced in 1997. In this room, a few vats and new casks about to be sulphured (méchage), see picture upper in the page. We walk into the new cask cellar, with barrels from Radoux and Berthomieu. They use a combination of 1-, 2-, 3- and 4-year old casks. Not too much of new oak, as the purpose is to bring softness, allow some oxydation and create balance. The 40-50 casks in the cellar are empty but will soon receive the Cabernet Franc and Cabernet Franc/Merlot blend. __2 Cabernet Franc 2005. From a small stainless steel vat. Has stayed in barrels since december and will go back there for another 12 months. Will be part of top tier reserve. Nice mouth. __3 Cabernet Franc 2005. From a bigger vat. More tannic. Also part of the reserve. __5 Riesling 2005 semi-dry. Very bright and clear. He says that compared with a tasting 10 days ago, the aromas go toward tropical notes, peach, apricot. It will later develop petrol notes. 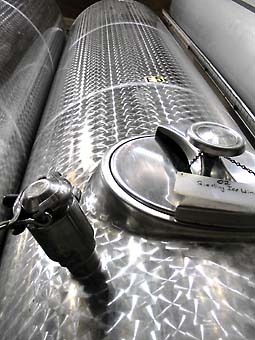 Riesling and 1/2 dry make up 35-45% of the total production. I feel apricot, mango. He says that as there is not a long history in the region, they make trials and look for the specific varieties that work well on this terroir. He now thinks that Riesling is one of them, for sure, and maybe also Sauvignon Blanc. For the reds, Cabernet Franc fares well here also. __6 Sauvignon Blanc 2004. Fresh wine. He says this is in line with the winery philosophy. They don't rely too much on alcohol, and harvest time for Sauvignon Blanc at Vineland is rather early compared wityh other wineries around. __7 Sauvignon Blanc 2005. A hot and dry year in Ontario. More Sancerre nose, while the previous millesime was more herbacious, more "New Zealand" style. Less acidity in the mouth. __ 8 Chardonnay 2004. Estate Chardonnay, priced 13,95 dollars. 13°. Nice nose. Rich. No oak. No micro-oxygenation for the whites, here. __9 Chardonnay 2005. Reserve Chardonnay. We are still at the bar but the sample was taken from a barrel. Turbid like a new wine. He keeps the lees to protect the wine. Beautiful nose. Crushed apricot, grapefruit, freshness (I wonder why the LCBO is afraid of turbidity...). 10% new oak here. There will be 12-15% new oak for the final blend. 280 cases planned for this Reserve Chardonnay. __10 Pinot Noir Reserve 2004. 13,3°. 40 Dollars. Nice nose. Matured colour. He says that some people argue that Pinot Noir is a good variety for Ontario. He is not sure, the region is too humid. Here they make 800 cases of it but there will be no more as they sold the plot. To grow Pinot Noir in Ontario, you need much more work in the vineyard, lots of sorting at harvest, and the wine is not stable in the barrel, so the bottle price must be at least 30 dollars, which is not easy to sell. If 7 out of 10 years, he could make Good P.N., he would have kept the vineyard, but in Ontario, the good millesime ratio is more 1 out of 7. __11 Sauvignon Blanc 2005 Reserve. Very bright. Fermented 100% in stainless vats. 5% removed to oak. Both aged on lees, then re-blended. 13°. Straight, fresh nose. Agreable mouth. The grapes were bought from Rosomel Vineyards, an estate they've been working with 15 years. This type of wine convinces him that Sauvignon Blanc is a great variety for the region. __12 Cabernet Franc 2004. Estate wine. A wine he says is his favorite, a great example of what can be done here. Priced 12,95 Dollars. Sold through LCBO (6000 cases). Very supple. Not too much substance but nice wine. Yield is 58 hectoliter/hectare. __13 Meritage Reserve 2002. Meritage in North America means Bordeaux blend. Here, the blend is Cabernet Sauvignon (40%), Merlot (30%) Cabernet Franc (30%). 18 months in oak. 13,2°. Very nice nose indeed. 100 Dollars. 75 cases. Will be even more interesting in 5 years or more. __14 Last but not least. He shows the bottle he opened 20 minutes ago : The first millesime he did himself as winemaker here : Riesling semi-dry 1993 [picture of Brian holding the bottle : top left]. 10,9°. 46 dollars. Older Rieslings are interesting because they get earthy, petrol and mineral notes in the aging process. Delicate and precise nose. Ripe white fruits. Bee wax. Another 3-4 years of potential, he says.The low alcohol level is incredible, similar to what you find in the Mosel region (in Germany) where they keep alcohol low. He travelled there and tasted a few 1984, 1987 wines which still taste great, with acidity and well alive in the mouth. Speaking of this first wine (1993), made when he had not acquired as much experience, he modestly says that "ignorance is a bless". Thank you Brian for this very long and extensive visit ! I was interested the article about yeasts. I've heard of that kind of thing in Sake. In Japanese Sake chais, There were used to be many wild yeasts in each chais, some of them live in the chais house, some of them come up while brewing Sake. But many Sake chais buy yeasts from somewhere, to flavor their Sake to someone's liking. The other Japanese liquors like Syouchu too. Nowadays, there are less sake chais using wild yeasts. I don't know the detail and reason though.